If we don’t get a government deal, then yes, probably. 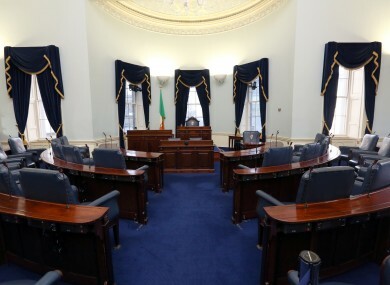 THERE ARE 60 seats to be filled in the Seanad, but those who get into the upper house may only be in the door a wet week before they have to leave again. Much like how the Dáil’s members are waiting anxiously to see if they have to go before the public once more, Senators are also at the whim of the government talks. According to the constitution, there must be a Seanad election within 90 days of the Dáil being dissolved. That happened on 3 February, so today’s Seanad vote happened with a week to spare. The failure to form a government, however, would mean that as well as another general election, we’d also need another Seanad election. As it stands even now, 11 of the members of the Seanad are directly appointed by the Taoiseach, so we can’t even complete the Seanad’s line-up without a Taoiseach. If this scenario seems rather pointless, it is even more so when one considers that TDs make up such a small proportion of those who actually get to vote in Seanad elections. Aside from the 100,000 or so NUI and TCD graduates who choose six of the Senators, TDs are also way outnumbered in the election of the 43 vocational panel seats. City and county councillors form the biggest bloc in this particular election, so a slightly altered Dáil make-up probably wouldn’t make the greatest of difference to a new Seanad vote. What may chanage, of course, is the people who go forward for the Seanad. The recent general election saw some high profile TDs losing their seats and instead seeking election to the Seanad. Another election might see them win back their Dáil seats, or even other Senators who failed to get a Dáil seat finally getting their chance. If it does happen that no government deal is done and the 32nd Dáil is dissolved, Environment Minister Alan Kelly would have seven days to sign the papers to make the new election official. Email “Is today's Seanad election a pointless exercise in futility? ”. Feedback on “Is today's Seanad election a pointless exercise in futility? ”.